Everything is perfect. Staff, location, apartment - everything. Will never use another lodging option in Lisbon, we will always stay here. The apartment was very luxurious, with a lot of attention to detail. The location was perfect. It was on a quiet street, but around the corner you had a lot of shops and restaurants. I liked the fact that I did not have to leave the room for breakfast, and fresh bread was delivered to the room each morning. The rainfall shower was also a huge bonus. I absolutely loved everything. Our apartment with terrace was absolutely fabulous. Big and beautiful. The fully stocked kitchen didn't miss anything. The wine glasses and plates and cutlery were so nice, better than my own! Fresh croissants were delivered to the apartment each morning and the refrigerator was stocked with eggs, cheese, yogurt, milk, etc. Everything you need for a great breakfast. The location couldn't be better, close to everything. I would love to go back! Great location and beautiful apartment. Quiet street . We could not fault this property. It was located in a quiet street but right in the centre of Lisbon. The flat was spacious, contemporary and beautifully designed with an incredibly well equipped kitchen and very comfortable furnishings. Fresh bread and croissants were delivered every day and the fridge was well stocked with other breakfast needs. The greeting was warm and the people on the reception desk were always very helpful and gave us some good restaurant suggestions. Everything was great. In the lead up to the arrival Claudia helped with any requests we had and then again when we arrived she was amazing. The apartment itself was even better than expected and I am so happy we chose to stay here. Thank you very much for everything. Great location. Great staff. The place was amazing. Cannot day enough about this place. Modern up to date amenities. Could not ask for anything more. Beautiful apartment. 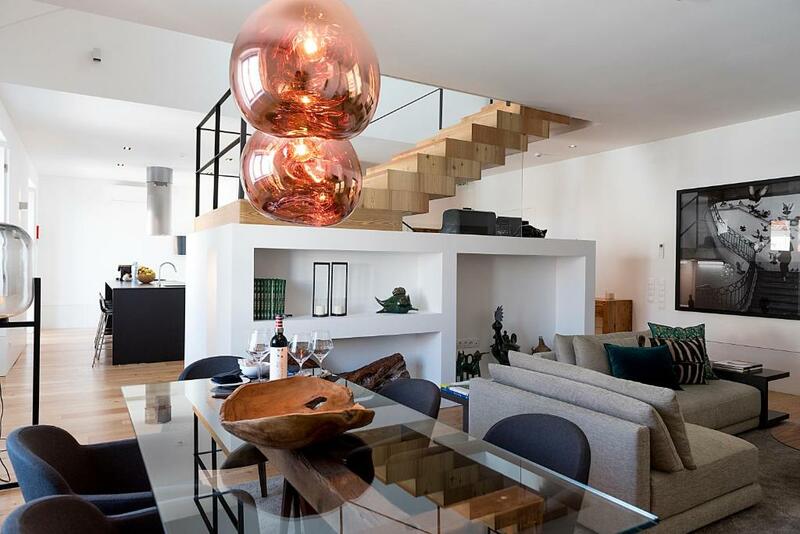 A modern apartment. So happy we stayed here. 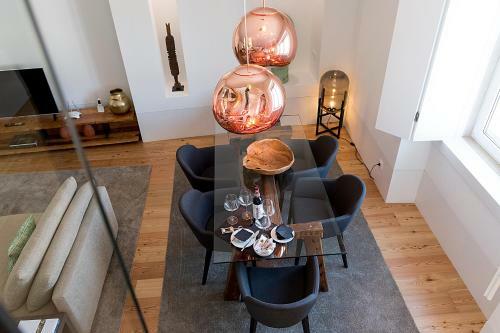 Lock in a great price for Flora Chiado Apartments – rated 9.7 by recent guests! One of our top picks in Lisbon – and a guest favorite. 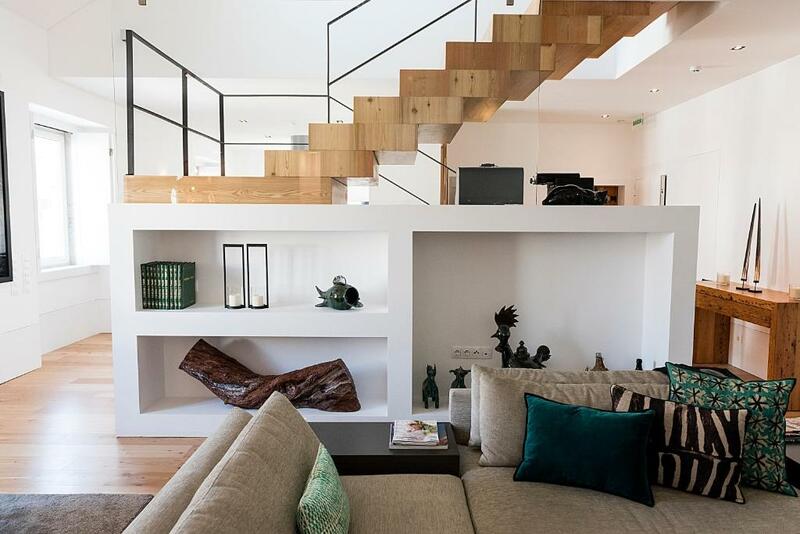 Located within a 12-minute walk of Rossio Square in Lisbon, Flora Chiado Apartments provides accommodations with seating area. Complimentary WiFi is offered. All units feature air conditioning and a flat-screen TV. There's also a kitchen in some of the units equipped with a dishwasher and an oven. Dona Maria II National Theatre is 0.7 miles from the apartment, while Bairro Alto is a 17-minute walk away. 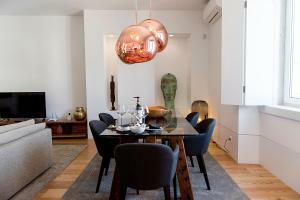 When would you like to stay at Flora Chiado Apartments? This studio features an open space living room, king size bed, large bathroom with bathtub, amenities, bathrobe and slippers. It has a full kitchenette, safe, cable TV, phone, air conditioner and a private entrance. This apartment features a living room with piano or fireplace, twin or king size bed, bathroom with bathtub, amenities, bathrobe and slippers. There is a full kitchenette, safe, cable TV, phone, air conditioner and a private entrance. This apartment features a living room with 18th century wooden cages, a master bedroom with a king size bed and a second room with twin beds. 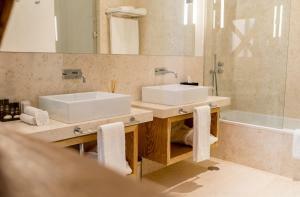 It also comes with 2 bathrooms, amenities, bathrobe and slippers. The apartment has a full kitchenette, safe, cable TV, phone, air conditioner, private entrance and small balcony. This apartment features a living room with fireplace, king size bed, private terrace with garden, bathroom with bath tube, amenities, bathrobe and slippers. There is a full kitchen island, safe, cable TV, phone, air conditioner and private entrance. This two floor apartment features a huge living room connected with a fully equipped island kitchen and service WC on the down floor, 2 rooms side by side with private bathroom each on the higher floor. The unit comes with amenities, bathrobe and slippers, safe, cable TV, phone, air conditioner, private entrance and small balcony. Explore um espaço renascido do passado mas reinventado pela criatividade contemporânea reaproveitando madeiras e azulejos seculares e acrescentando o conforto do design e a elegância do mobiliário de vanguarda. Passado e presente mesclam-se em cenários mais espaçosos ou intimistas mas ambos charmosos e pontuados por pormenores como as gigânticas fotografias que são também “janelas” para descobrir Lisboa. Luz e espaço são o que mais prezamos e irão surpreendê-lo tanto nas salas e cozinhas como na própria privacidade dos WC. Entre lareiras volumosas e terraços elegantes escolha a data e deixe a magia nas nossas mãos. House Rules Flora Chiado Apartments takes special requests – add in the next step! Flora Chiado Apartments accepts these cards and reserves the right to temporarily hold an amount prior to arrival. Please inform Flora Chiado Apartments of your expected arrival time in advance. You can use the Special Requests box when booking, or contact the property directly using the contact details in your confirmation. The staff at the apartments were fantastic, incredibly welcoming and helpful throughout, very happy to go The extra mile to make your stay perfect. The apartment was extremely comfortable and the facilities within left nothing wanting, with everything you could need including an orange squeezer and a fridge full of oranges. Would highly recommend these apartments. They are ideally placed, fantastically run and extremely well laid out. We were there for two nights in March with two of our daughter's who are 18 and 23. Two hotel rooms would have cost almost as much, but without the freedom and flexibility of the apartment, we enjoyed every minute of our long weekend and the apartment played a great part in that. I would highly comend it. I highly recommend Flora Chiado. We are two couples travelling together and we had booked a two bedroom apartment (the 120 m2 one). The apartment was beautifully decorated and spacious: a place where you can relax and enjoy quality time together, just what we were looking for. There are two separate bathrooms so enough privacy, the beds are very comfortable and the apartment is quiet even though it is in the middle of Lisbon. The fridge was filled daily with enough items to cook up a nice breakfast. We particularly loved the fresh bread and the oranges to juice. We hope to visit again sometime! Wonderful stay in Lisbon :-) The appartement we stayed was absolutely comfortable, beautiful designed and great equipped. If we could wish we would stay longer. 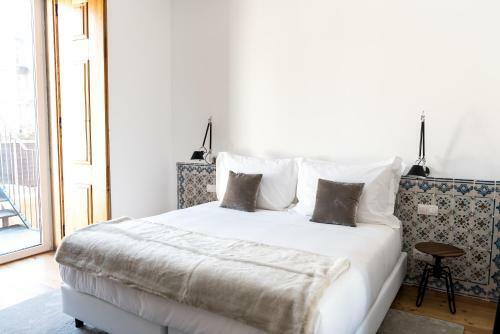 Lisbon itself makes your travel interesting and Flora Chiado Appartements makes it cosy. Great thanks to the staff. We appreciate your kindness, your welcome, your quietness and how clean the apartment was. Clean, bright, spacious, well equiped apartment in the heart of Lisbon, 3 minutes from Baixa/Chiado metro. Fresh bread and croissants every day for beakfast with fruit ham, cheese, yoghurt replenished as used. Modern design qaulity furniture extremely well maintained. 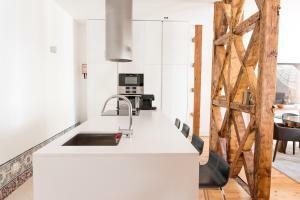 Stylish, fresh, well equipped apartments in the central location, very close to the main attractions. The lady at the reception could have been warmer and more helpful. Everything. Very smart and homely. The Christmas tree was a wonderful touch. The location could have been better, but with that said, there is a mall and places to get food within walking distance. Also, the time our market is fairly close to the property. Stayed here during Websummit 2018. As a frequent traveller I can easily say this has been the best value/money place I’ve stayed in during 2018. Personal/warm service and all the service that a hotel usually brings. Apartment had great location and the rooms are HUGE and very modern. If you’re hesitating to book - simply don’t because you won’t regret it ! The whole experience was amazing. Warm welcome. Comfortable space. Delicious breakfast. Wine and cheese when we arrived was especially nice. 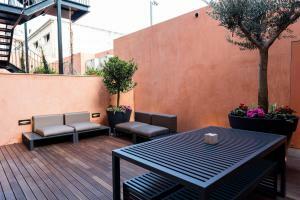 Great location too - above a two star restaurant with lots of great bars and shops nearby.